There are tremendous opportunities to reframe our mindset towards future development, especially as we invest in new transit links. After 15 years living in Beijing and Shanghai designing and planning projects across China, from remote locations to mega cities, I’m struck by three significant differences since moving to Seattle: The perception of scale between East and West coasts; the drivers determining a development’s mix of uses; and how a development’s timeline can impact the outcome of projects. In China, growth is happening on a massive scale. New cities materialize where industry and agriculture once stood, while vast corporate campuses bloom around elaborate infrastructure systems. The Chinese take this growth and expansion as the norm  a sign of prosperity. Although development is happening on a large scale, there are lessons to be learned to ensure that it doesn’t eradicate the rich existing structures that work. In Seattle, there seems to be a perception that new developments tower over buildings that existed there before. Density and height discussions focus on aesthetic and visual impact to neighbors first  and benefit for the common good last. The long-term socio-economic benefits and opportunities are often overlooked and depreciated. 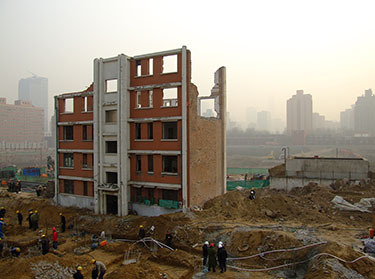 At one of B+H’s projects outside Beijing, occupants of the remaining residential block refused to leave, even as half of the building had been dismantled and services were cut. They wanted more relocation money. This master plan for the Guangzhou/Foshan corridor integrates local villages and supports affordable housing.